It’s one of my favorite times of the year because the NBA Playoffs are in full swing, and that means almost nightly broadcasts of the best sports show on TV, Inside the NBA. I’ve long been a fan of host Ernie Johnson, Jr.’s work, but even more so after watching the ESPN E:60 segment on his life away from the broadcast booth. 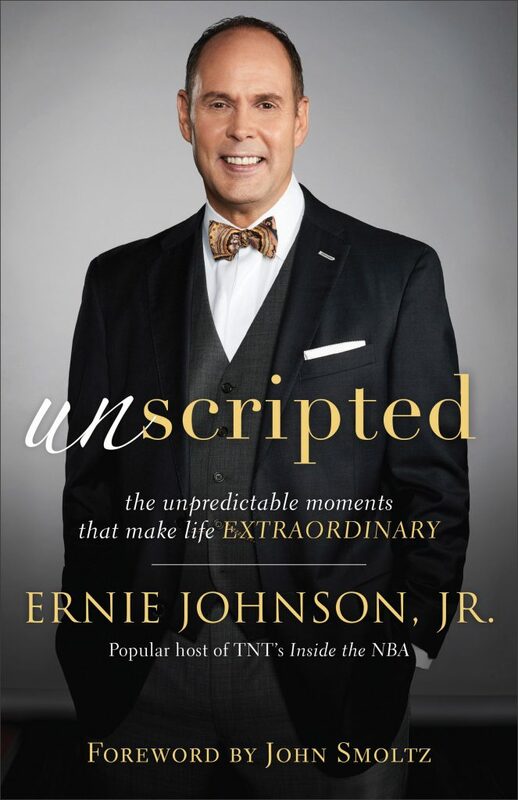 Johnson’s new book, Unscripted: The Unpredictable Moments that Make Life Extraordinary, reveals more about his remarkable life and shows, once again, what makes him one of the most respected sportscasters–and human beings–in the business. If you’ve seen the E:60 documentary, you’ll be familiar with much of what Johnson talks about in his book. He traces his childhood (the son of Atlanta Braves pitcher and long-time broadcaster Ernie Johnson, Sr.), his studies at UGA, his early TV work in Georgia, his marriage to wife Cheryl, the birth of their two children, and the adoption of four more (three of whom have varying degrees of special needs). Fairly quickly into Johnson’s book, you just know that this is a guy you’d want to grab a beer with to talk about sports and–more importantly–life. Throughout his book, Johnson refers to blackberry moments (the name comes from a funny, early childhood story), those unexpected times in life that make us feel joy, gratitude, a sense of community, love, grace, and all those things that give life its spiritual flavor. If there’s one overarching theme to Johnson’s reflections, it’s openness. Johnson encourages his readers to be open to God, the moment, friends, family members, nature. To do so, we often need to slow down, or pause, in the midst of our hurried and harried lives. In doing so, we might also spot those moments where we can be unscripted gifts to those around us. It might be harder now than ever, but that means it’s more important now than ever before. I was particularly interested in Johnson’s reflections on his religious and spiritual experiences, and while Unscripted isn’t a work of theology, the ways in which he speaks about these moments in his life reveal the complexities and shortcomings of so much of Southern, Evangelical Christianity. Johnson speaks openly about his life and spirituality, and it’s a story that might resonate with many readers. He claims to having lived a “me-centered” existence and being more concerned with career than family, friends, or faith, constantly worrying about the next job or experience that would provide happiness and contentment. In the midst of all this, he began to sense that there was something more to life, a deeper calling and purpose. Of course, most of us sense this on a daily basis, whether we are people of faith or not. On the other hand, we must hold this in tension with the rest of his story, specifically the years before his salvation moment, which reveals a life of profound selflessness. His and Cheryl’s adoption of Michael (a Romanian orphan with a laundry list of physical disabilities), their adoption of Carmen, and the way they raised their two children tell a different story, and it’s one that simply cannot be dismissed, from a Christian perspective, because it didn’t emerge from an explicitly Christ-centered approach. As an ex-Evangelical, lots of Johnson’s “Christianese” made me cringe, but it also made me think more about the Christian life. Evangelicalism places so much emphasis on the moment of salvation…of “inviting Jesus into your heart to be your personal Lord and savior,” as if salvation has ever been, or could ever be, a one-time event. But Johnson’s life–and his reflections on it–imply that it’s the process of a lifetime. Unscripted: The Unpredictable Moments that Make Lie Extraordinary (215 pgs.) is available from Baker Books.